Let’s move on down the coast to the state of Georgia. In a previous post, we explored the history and sights of Jekyll Island. Jekyll is one of the so called ‘Golden Isles’ of Georgia, to which Sea Island, St. Simons Island and Little St. Simons Island also belong. But first, a little bit about some of the islands near the stately city of Savannah. 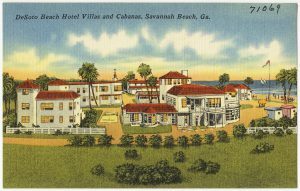 Tybee Island, is a part of the Savannah metropolitan area and for a time was officially named Savannah Beach. Its historic lighthouse marks the most eastern point in the state of Georgia. Built in 1736, it was the highest structure in America at the time. Tybee began to flourish as a tourist area with the construction of a railway in 1887. Summer cottages sprung up around the island and a pavilion was constructed. In the 1920s, a bridge was constructed and by the 1940s, there were four hotels. On February 5, 1958, two air force planes collided during training exercises, one of which was carrying a Mark 15 hydrogen bomb. Although the planes occupants survived, the “Tybee Bomb” was lost and has never been found, despite numerous searches. According to the air force, the bomb did not actually contain a nuclear capsule, and therefore was not a safety threat. Tybee constructed a new pavilion and pier in 1996, the prior one having burned down in 1967. It is an excellent locale for summer concerts and people watching. There is a beach bum parade that takes place every year, along with the biggest water fight in the South. 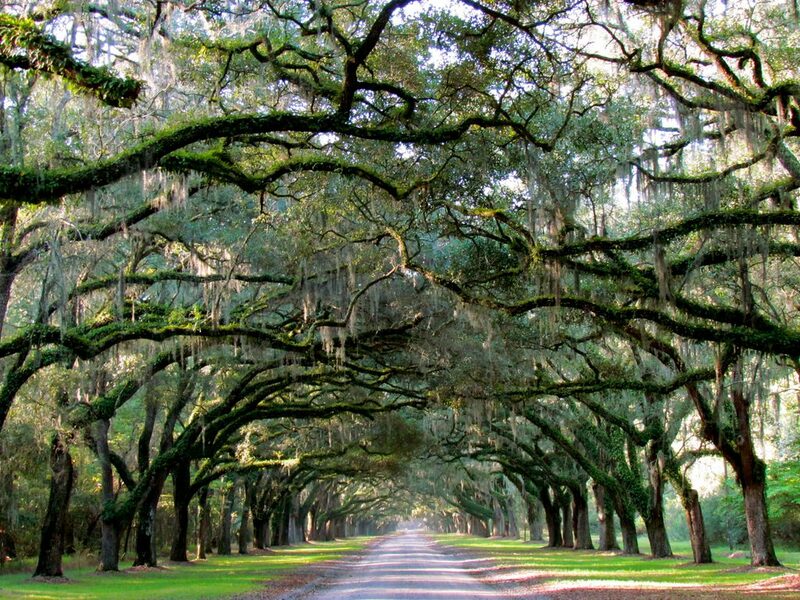 Also near Savannah are Skidaway Island, location of ‘The Landings’, one of the largest gated communities in the country, and Skidaway Island State Park. The affluent Isle of Hope, is another island known for its beautiful waterfront properties. The site of historic plantations, Isle of Hope was also well known in the 1920’s for Barbee’s Pavilion, a terrapin farm which supplied terrapin to Russian Czars and New York City restaurants. Ossabaw Island, one of the largest of the Sea Islands was privately owned until 1978, and operated as an artist and scholar retreat, attracting numerous writers and even composers Aaron Copland and Samuel Barber. It continues to offer educational programs and weekend retreats based on education, culture and science to students, teachers, artists and researchers. The general public must apply to visit the island. Sapelo Island is less developed and accessible by ferry only. 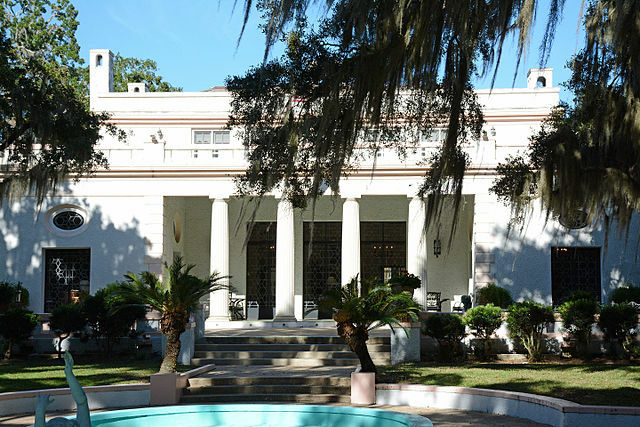 Its two main attractions are the mansion of tobacco magnate R.J. Reynolds, which is now operating as a hotel, and Hog Hammock, one of the most intact Gullah/Geechee communities. 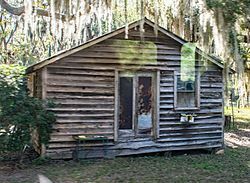 Privately owned for much of its history, Sapelo was purchased at the beginning of the 19th century by Thomas Spalding, a senator and native of St. Simons Island. A leading planter of Sea Island cotton, Spalding, his land also produced rice, sugar cane and oak with the help of over 350 slaves. In 1912, Howard E. Coffin, of the Hudson Motor Company, purchased the island, except for Hog Hammock, and fixed up Spalding’s house, which had been vandalized in the civil war. Presidents Calvin Coolidge and Herbert Hoover as well as Charles Lindbergh were all to become guests of Coffin’s on Sapelo. In 1934, the island was purchased by Reynolds and used as a summer retreat for three decades. Hog Hammock consists of several homes, a general store, two churches, a bar and public library on 427 acres and is listed on the National Register of Historic Places. The residents are ‘Saltwater Geechee’ who had worked on the plantations and as servants at the Reynolds Mansion. 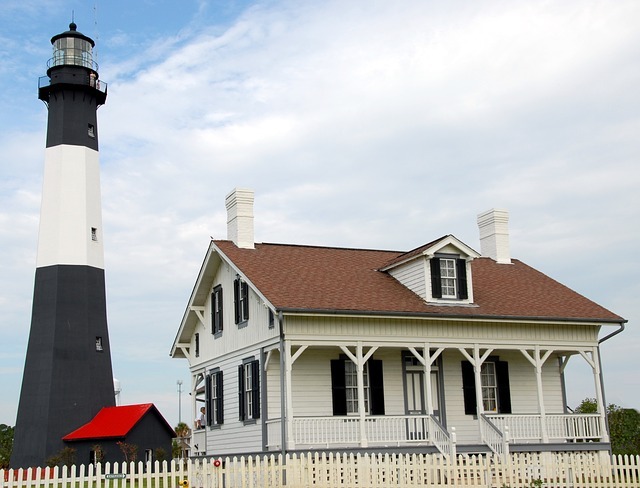 Little St. Simons Island is the first of the Golden Isles as you head down the coast. It is the smallest of the group, and has been privately owned since 1760. The lodge and entire island can be rented as part of an all inclusive vacation package for up to 32 people. This package includes three meals daily, a wine and hors d’oeuvres social hour, Friday evening oyster roasts, seaside lunches and all soft drinks, beer and wine. The island has seven miles of unspoiled beach and 11,000 acres of wilderness to explore. The rooms at the lodge and nearby cottages can also be rented separately. Sea Island is also a privately owned island. Linked by a causeway to St. Simons Island, it supports a handful of resorts and one of the nation’s wealthiest communities. The Cloister was opened by Detroit auto manufacturer Howard Coffin in 1928, who envisioned the island as a seaside paradise. 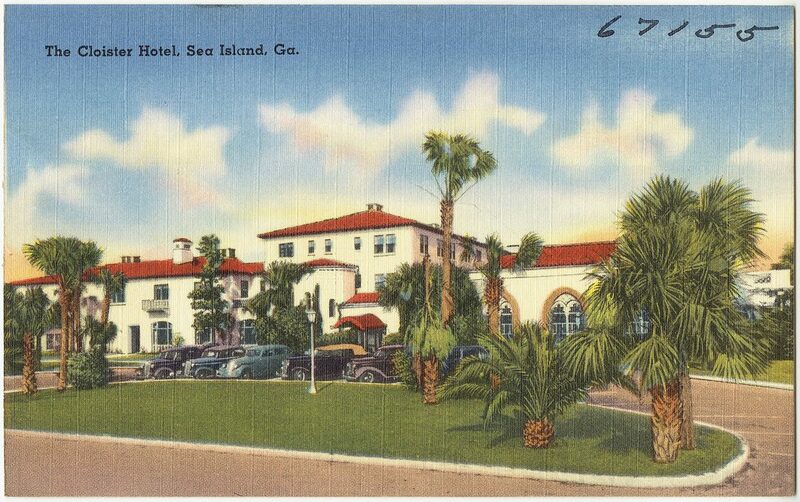 Although he did not live to see the full extent of his dream realized, Coffin’s vision led to Sea Island establishing an international reputation with heads of state, royalty and celebrities becoming regular visitors to the island. Writer Eugene O’Neill wrote his novel Ah, Wilderness! while staying on the island. George H. W. and Barbara Bush spent their honeymoon on the island, and in 2004, the G8 Summit saw heads of state from around the world convening on the island. President Calvin Coolidge started a tradition on the island of planting a commemorative live oak, a tradition that was to be continued by such figures as Presidents Eisenhower, Ford, Carter, Clinton, Bush (1 and 2), Margaret Thatcher and Tony Blair. Sea Island is the only resort destination in the world to have been awarded 4 Forbes Five Star Awards, nine years in a row. 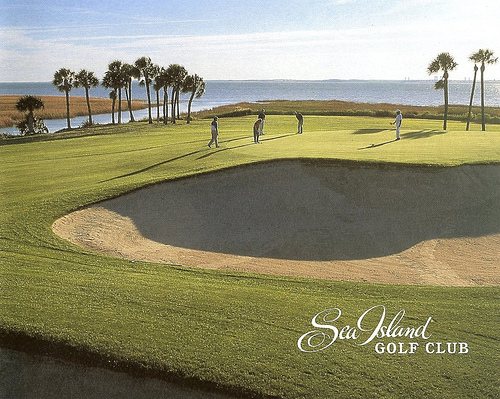 The Cloister at Sea Island, The Lodge at Sea Island, The Georgian Room restaurant and the Spa at Sea Island have each received this designation for the last nine years. 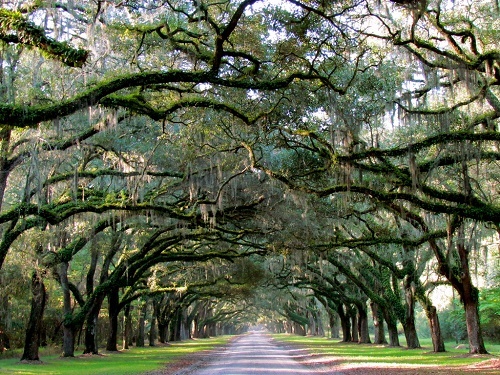 St. Simons Island, linked to the mainland by a causeway, is the largest of the Golden Isles. It has quite a bit of interesting history. Native Americans inhabited the island as far back as 2,000BC. The Timucuan were the tribe encountered by Spanish missionaries, who set up two missions on the island. These were left abandoned after a series of pirate raids around 1684. By 1702, the Spanish had left the island, but General James Oglethorpe established Fort Frederica in 1736 as a protection against Spanish incursions. Fort Frederica became a military center of Georgia during the colonial period, and the town of Frederica was established around the fort. 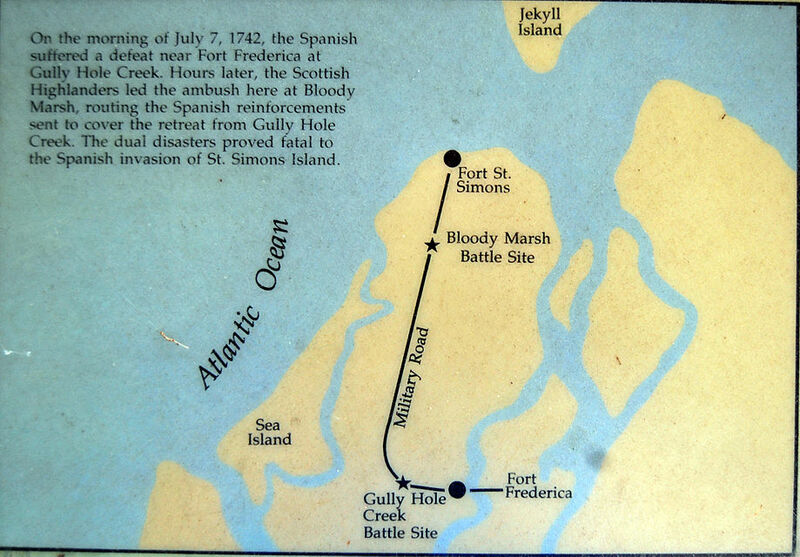 The Battle of Bloody Marsh, which occurred on the island on July 7, 1742, was a decisive victory for the English colonists, effectively ending Spanish attempts to invade Georgia. The 1730s saw the arrival of John and Charles Wesley, Anglican missionaries on a quest to convert slaves and colonists as part of the religious revival known as the ‘Great Awakening’. Charles was a secretary to General Oglethorpe and chaplain at Fort Frederica. He is known for writing hymns, including ‘Hark, the Herald Angels Sing’. The brothers went on to be founders of the Methodist Church after leaving St. Simons. 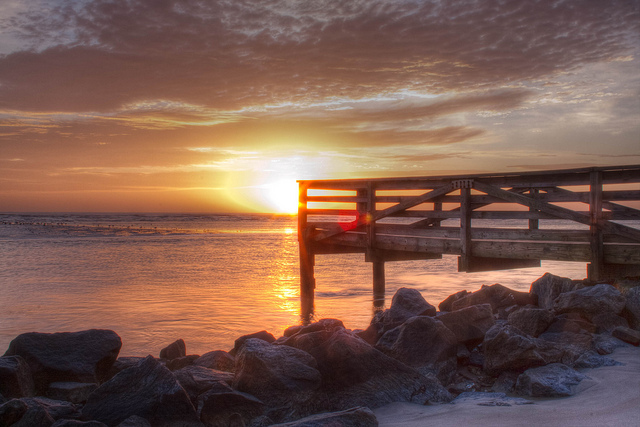 There is much to see and do on St. Simons. The legacy of the Wesley Brothers, the cotton and rice plantations, Fort Frederica and the Spanish missions bathe the island in history. It is also the most developed of the Sea Islands and offers hotels, condos, restaurants, water sports, golf and sailing. There is an annual festival of Gullah culture called the Georgia Sea Island Festival and the island is home to music and theater groups. 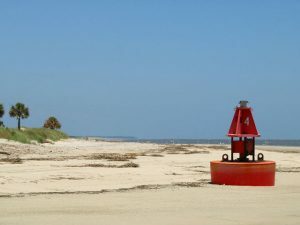 Other popular attractions include the St. Simons Lighthouse Museum, Bloody Marsh, the Avenue of the Oaks and Christ Church in Frederica, all of which can be visited by trolley tours of the island. Jekyll Island, whose fascinating story is explored in another post, is home to the Jekyll Island Club, the Georgia Sea Turtle Center, Driftwood Beach, Summer Waves Water Park and, of course, ‘Millionaires Village’, a National Historic Landmark District where you can visit the “cottages” of some of America’s wealthiest citizens. We end our tour of the Sea Islands at Cumberland Island, the southernmost of the Georgia Sea Islands. To be fair and accurate, the chain of Sea Islands extends into Florida. Maybe in another post we will include Amelia Island with some of the Florida islands. 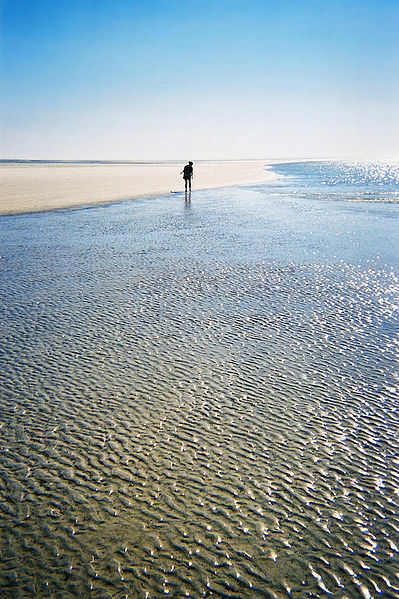 Cumberland Island is home to the largest island wilderness in the USA. It is partly private and only 300 visitors at a time are permitted to visit. There are no restaurants or stores on the island, but there is plenty to see. There are only two choices of accommodation on Cumberland Island – camping, or the five star Greyfield Inn. Originally named San Pedro by the Spanish, who visited as early as 1550 and thereafter established a mission, the island was the site of several skirmishes between the Spanish and French, which resulted in abandonment of the island in 1684. General Oglethorpe established a hunting lodge on the island in 1736, which he called Dungeness. 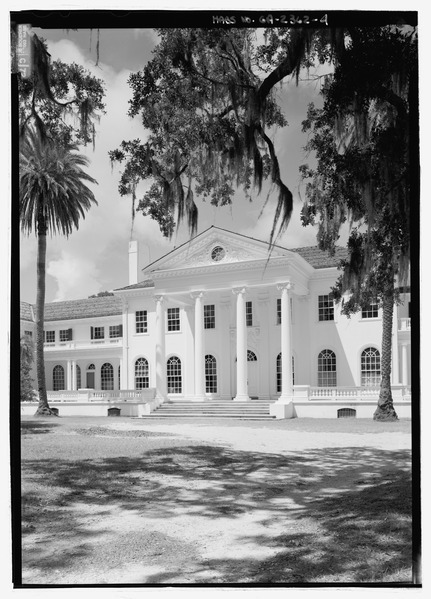 In 1803, Revolutionary War hero Nathanael Greene built a mansion on the site of a Timucuan shell mound, which he also named Dungeness after General Oglethorpe’s lodge. It was used by the British as headquarters in the war of 1812, abandoned during the civil war, and subsequently burned down in 1866. In the 1880s, the wealthy Carnegie family purchased the land and built a 59 room Scottish castle on the site which they called – Dungeness. That one burned down too in 1959 (the Carnegies moved out in 1925). Today, the ruins are preserved by the National Park Service. 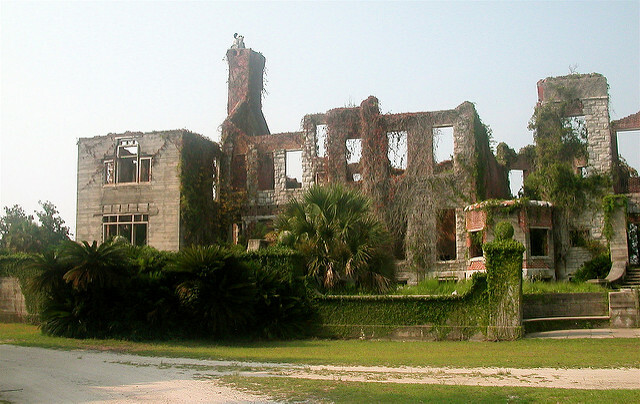 At one time, the Carnegies owned 90% of the island, building other estates for family members. Plum Orchard, Stafford Plantation, and the Greyfield Mansion, (now the only hotel on the island) are all still highlights of a visit to the island. Other attractions include the perfect beaches, wild horses, fresh water lakes, the Ice House Museum, located in one of the Carnegie service buildings and ‘The Settlement’, on the northern tip of the island, which is a small cluster of buildings abandoned by former slaves. The most notable building is the First African Baptist Church. 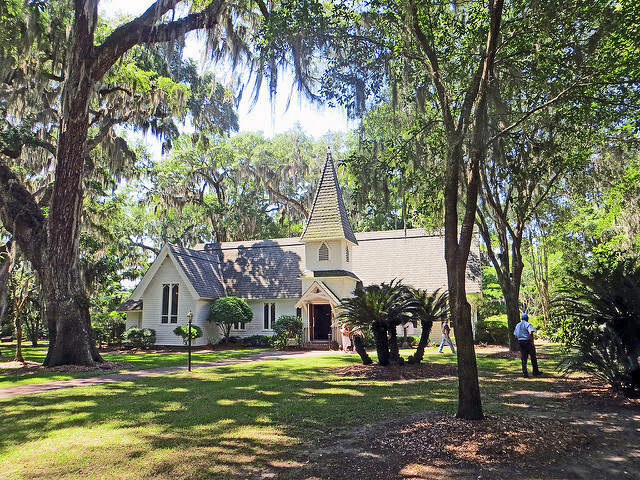 John F. Kennedy, Jr. was a frequent guest on Cumberland Island and chose the remote chapel for the occasion of his marriage to Carolyn Bessette on September 21, 1996. And that brings us to the end of our Sea Islands tour!